Frodo’s quest to carry the One Ring through trouble and turmoil into the fiery pits at the heart of Mount Doom is undoubtedly one of the most iconic journeys in fantasy. He faced dangers from roaming parties of Orcs and even his own companions, even as he was constantly hounded by the pursuing Nazgûl. Now, you can experience this epic quest for yourself in a fraction of the time. The Lord of the Rings: Journey to Mordor will be available on October 20th at your local United States retailers! 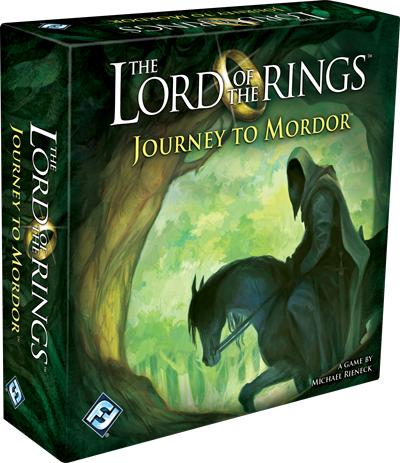 As a fast-paced, push-your-luck dice game for two to four players, Journey to Mordor encapsulates the frantic panic and stouthearted perseverance that characterized every step of the Fellowship’s adventure. During the game, you play as one of the hobbits racing to reach Mount Doom before your opponents—always staying a few steps ahead of the Ringwraiths that haunt your footsteps. With skill and luck, you may triumph and destroy the One Ring at Mount Doom, but if you fail, all of Middle-earth will be consumed in darkness. Your resolve may be unshakable at the beginning of your journey, but the wide breadth of Middle-earth lies before you. 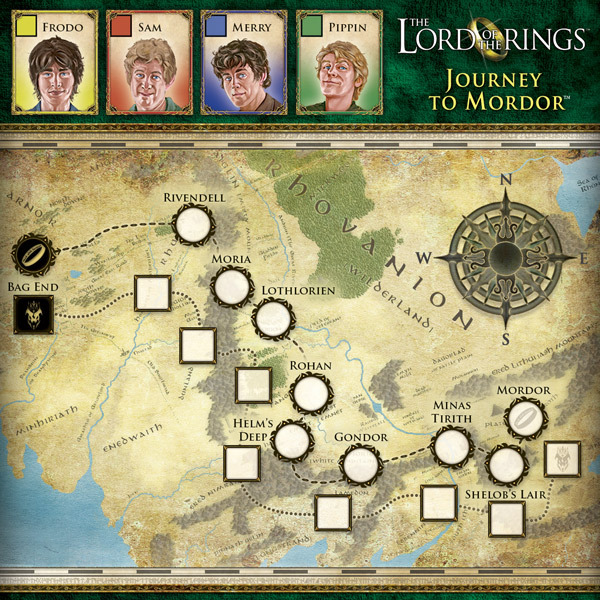 At the beginning of the game, each player receives a sheet of paper showing two tracks, leading from Bag End into the heart of Mordor. One of these tracks is for your own journey, but the other is for the Nazgûl that are called unerringly to the Ring. If you reach Mordor before any other player, you win the game, but if the Nazgûl arrive at the Mountain of Fire before you, you will be eliminated! Each turn, you’ll begin by rolling the five colored dice. You can choose to keep any number of dice, so long as you don’t keep more than one showing the same symbol. For instance, if you roll two Fellowship results, you’ll only be able to keep one of them from this roll. Based on the results you roll, you may be able to move closer to Mordor, but the forces of darkness may advance as well. To move along your path, you’ll need to have Ring results saved at the end of your turn—you’ll move one space forward for each Ring that you have saved. Unfortunately, these Rings are easily canceled. A single uncanceled Orc will cancel all of your Rings. To fight off the Orcs that harry your steps, you’ll need to save Fellowship results from the dice that you roll as well. Of course, the Orcs are not the only threat that you’ll encounter along your journey. The Nine Ringwraiths are always on your trail, disguised as riders in black. One side of each die shows the Nazgûl result—which you must keep if you roll it. Each Nazgûl result causes the Nine to advance one space along their track, moving closer and closer to Mount Doom. You can, however, seize the opportunity to send these wraiths chasing one of your opponents. If you roll a Nazgûl result on a die that matches another player’s color, the Nazgûl advance along that player’s track, rather than your own! Even if the Nazgûl are chasing after you, you’ll be able to slow their progress by keeping any Gandalf results that you roll. If you want to relive Frodo’s quest even more accurately during your games, you can also choose to play with the advanced rules, introducing special circumstances that befall you wherever you stop. Some locations may be helpful: for instance, while recovering in Lothlorien, you’ll find it much easier to fight off Orc raiding parties. Other locations may test your strength to the utmost—in Minas Tirith, the Witch-king of Angmar leads the assault, and any Nazgûl that you roll become more deadly for every player. Your journey will lead you from the pastoral glades, gentle streams, and little hills of The Shire to the barren, blasted plains of Mordor. The servants of the Dark Lord are everywhere, and his greatest servants are on your track. Experience the terror and dangers of Frodo’s quest with The Lord of the Rings: Journey to Mordor, available October 20th at your local United States retailer! The Lord of the Rings: Journey to Mordor is a fast-paced dice game that invites two to four players to experience Frodo's epic journey to Mordor in a fraction of the time. 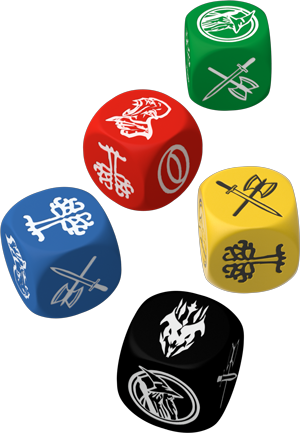 During the game, you'll roll a series of dice, pushing your luck to press forward while evading the Nazgûl and Orcs that plague your footsteps. The first player to reach Mount Doom and destroy the One Ring wins the game!